April 2018 www.coalage.com 25 renewable energy continued The sun continuously bathes the earth with light energy (irradiance) with only modest interruptions by solar eclipses. The illuminated area (at any given time) of the earth is 255 million km 2 . Of these, 74 million km 2 is land. The rest is ocean. These oceans are teeming with sin- gle and multicellular organisms that convert solar insolation into chemical energy. So, too, are the land areas rife with photosynthesizing flora. From these activities, a chemical cornucopia of compounds provides the foundation for life, through the storage and transport of vital energy. These activities began about 3.4 billion years ago, the bounty of which is stored solar energy ready for our use, now. Allowing for the incident fall-off of the sun's irradiance (insolation), it follows that at any moment the earth receives, on average, 6.375 petawatts (a petawatt is 1,000,000,000,000,000 watts) of solar en- ergy at the surface of the planet (or about 56,000 petawatthours annually.) However, the mean efficiency for deployed photo- voltaic devices is about 13% (to be fair, there are tested devices with maximum efficiencies of about 23% under ideal con- ditions). Therefore, if one could cover the earth with photovoltaic cells, the solar en- ergy could continuously power 780 billion toasters or about 100 toasters per person living today. But, most of the planet is water. There- fore, the maximum area available for prac- tical use is significantly less. 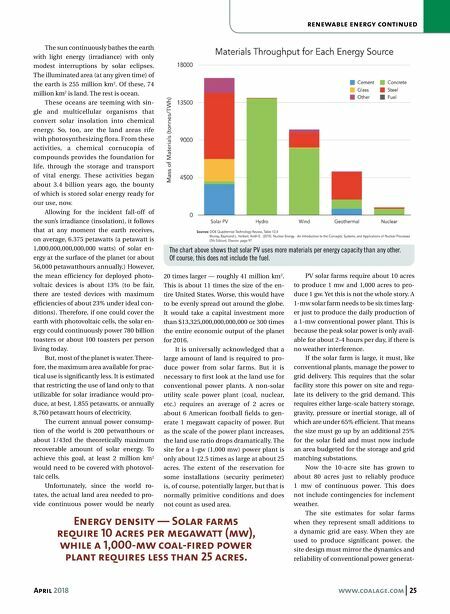 It is estimated that restricting the use of land only to that utilizable for solar irradiance would pro- duce, at best, 1.855 petawatts, or annually 8,760 petawatt hours of electricity. The current annual power consump- tion of the world is 200 petwatthours or about 1/43rd the theoretically maximum recoverable amount of solar energy. To achieve this goal, at least 2 million km 2 would need to be covered with photovol- taic cells. Unfortunately, since the world ro- tates, the actual land area needed to pro- vide continuous power would be nearly 20 times larger — roughly 41 million km 2 . This is about 11 times the size of the en- tire United States. Worse, this would have to be evenly spread out around the globe. It would take a capital investment more than $13,325,000,000,000,000 or 300 times the entire economic output of the planet for 2016. It is universally acknowledged that a large amount of land is required to pro- duce power from solar farms. 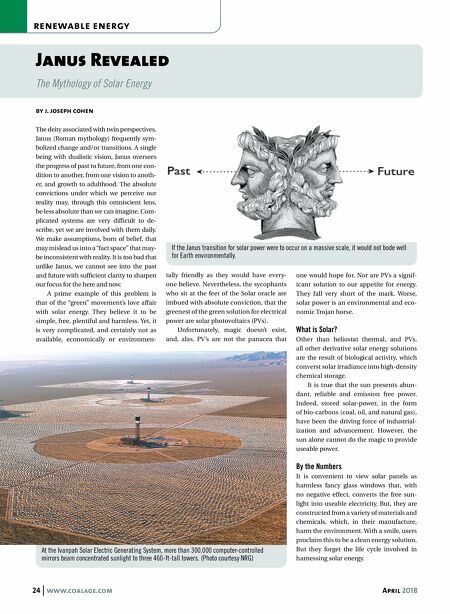 But it is necessary to first look at the land use for conventional power plants. A non-solar utility scale power plant (coal, nuclear, etc.) requires an average of 2 acres or about 6 American football fields to gen- erate 1 megawatt capacity of power. But as the scale of the power plant increases, the land use ratio drops dramatically. The site for a 1-gw (1,000 mw) power plant is only about 12.5 times as large at about 25 acres. The extent of the reservation for some installations (security perimeter) is, of course, potentially larger, but that is normally primitive conditions and does not count as used area. PV solar farms require about 10 acres to produce 1 mw and 1,000 acres to pro- duce 1 gw. Yet this is not the whole story. A 1-mw solar farm needs to be six times larg- er just to produce the daily production of a 1-mw conventional power plant. This is because the peak solar power is only avail- able for about 2-4 hours per day, if there is no weather interference. If the solar farm is large, it must, like conventional plants, manage the power to grid delivery. This requires that the solar facility store this power on site and regu- late its delivery to the grid demand. This requires either large-scale battery storage, gravity, pressure or inertial storage, all of which are under 65% efficient. That means the size must go up by an additional 25% for the solar field and must now include an area budgeted for the storage and grid matching substations. Now the 10-acre site has grown to about 80 acres just to reliably produce 1 mw of continuous power. This does not include contingencies for inclement weather. The site estimates for solar farms when they represent small additions to a dynamic grid are easy. When they are used to produce significant power, the site design must mirror the dynamics and reliability of conventional power generat- The chart above shows that solar PV uses more materials per energy capacity than any other. Of course, this does not include the fuel. Energy density — Solar farms require 10 acres per megawatt (mw), while a 1,000-mw coal-fired power plant requires less than 25 acres.